Feedburner has offered feeds by email for a long time and it is one of the things every blogger using Feedburner could utilize. If you don’t offer a way to subscribe by email, consider how many readers who don’t use a RSS feed reader but like your content. You could be missing out on dozens of readers. In fact, there are a few sites I like to get updates by email than in my Feed Reader. FeedBurner provides an easy to create Feed-By-Email service right in your RSS feed account. You will find that under Publicize -> Email subscriptions tab. FeedBurner was acquired by Google and things have been slow going and there was little news in the FeedBurner front until recently. Google started moving FeedBurner feeds under the Google umbrella and started offering Adsense for RSS Feeds. FeedBurner just improved the Feeds-by-Email service with a lot of addtions to Subscriber List Management. Feedbuner email is now delivered via the same infrastructure that handles Gmail. Means much more robust email handling for you. Paginated subscriber list – showing the first 150 loading the page faster. Export subscriber list – You can now export the complete subscriber list as a CSV file. Besides the above new features, did you know you could already do these with your FeedBurner email? Have Your Moved Your Feed to Google? But, if you have a Google Adsense account, now you can initiate the move directly from within your Adsense account. Google says moving from withing FeedBurner.com should also be available soon. Plus, your Adsense for Feeds ads also appear in your feeds by email. If you don’t have a Google Adsense account, you can still use FeedBurner.com feeds and Feeds-By-Email service. You will just be missing out on the new features until Google moves all the FeedBurner feeds. FeedBurner has a feature turned on by default – Item link clicks. It’s a nice feature that gives you stats on clicks from your feeds. It has one downside. The url in the feed is not a direct link to your RSS feed but actually a redirect. Here’s why I turn off FeedBurner redirect. When I am browsing through my RSS feeds in Google Reader and like a post that I want to link to, I just right click on the title of the post and use the url for the link. You are either making me load the redirect url to get your correct link or if I am lazy or in a hurry I just use the redirect link (I just use the redirect link in Twitter) and you might have just lost a potential link juice. 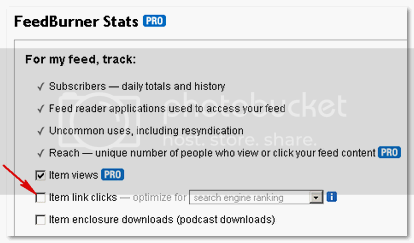 You’ll find this under Services -> FeedBurner Stats (PRO) link in FeedBurner accounts and Services -> Configure Stats link in Google FeedBurner accounts. That is partially true depending on which option you chose for the Item link clicks. If that didn’t convince you, here’s another clincher. Many of my readers here take advantage of the fact that you can get DoFollow, CommentLuv and KeywordLuv for your comments. CommentLuv plugin trys to get your most recent post by parsing your RSS feed and if it grabs the redirected feed from FeedBurner, you could be again potentially losing link juice from those DoFollow blogs you are leaving comments on. Stephen of Scratch99 makes a strong case for why you should turn off FeedBurner redirect as well. So please consider turning off FeedBurner redirect and make it easy for others to link to your content. I guess I digressed a bit from from using the FeedBurner’s email service to RSS feeds. But, it irks me so much when I can’t use your post links straight from Google Reader. FeedBurner is an excellent free service that every blogger can use and with these few tips I hope you make the most out of it. Got more tips? Lets hear it! Thanks for the tip on turning of the link redirect in the Google feed – I had no idea that’s what was happening. Very good info – Gracias! Agitationists last blog post..Web-safe Fonts: the Beginning of the End? Got caught by that redirect thingo some time ago. Didn’t realize at first that my comments on sites which used CommentLuv weren’t linking to my blog. Lol. 🙂 Thankfully, I eventually realized that, and rectified the situation. It’s a good feature which i use on a few blogs. I have found that people sign up for it then when they start getting your posts sent to their email they forget why, and spam you. A few of my blogs comment notifacation messages go into the spam folder of gmail because of this. Still a good feature to get more subscribers. You are completely right K, I just wrote about this on my IM blog. I for one only do email for blogs I read, if they don’t offer it, I just pass them by, I do not have the time to check a reader everyday, I love the email option. It is really shocking how many blogs do not offer this feature. Not everyone likes or understands RSS so offering an email version is sensible and with Feedburner it makes it easier. Happy holidays to you too. and a belated Christmas wishes..
I’ve installed feedburner too by this is good setting guides that I have never really applied. I’m a dweeb do I want to check or uncheck ‘item link clicks’?